Last year was a big one for news in Southeast Asia. Here are some suggestions on what to expect in 2012. Last year saw some of the biggest political developments in Southeast Asia in decades. Burma finally seemed poised for real change, while Thailand continued to move closer to the brink of self-immolation, as political in-fighting worsened. The United States, China, and Association of Southeast Asian nations continued to raise the stakes in the South China Sea, to a point where, now, it seems unlikely anyone can back off their claims and truly sit down at the table to negotiate some kind of agreement. Singapore had its most competitive election in generations, while in Malaysia massive street protests have clearly rattled the government. Even smaller states faced political turmoil: Papua New Guinea went for weeks with two prime ministers – and the potential for civil strife – before the situation was resolved. China will bring back the charm. Over the past two years, Beijing has cost itself much of the gains it made in Southeast Asia in the late 1990s and early 2000s, when it appeared to be a good neighbor, trading partner, and investor. Through its belligerent approach to the South China Sea issue and, to some extent, the Mekong River, Beijing has scared many Southeast Asian nations enough that they have welcomed back a greater role for the United States in the region, even though their populations haven’t exactly become pro-American. The reasons for China’s shift are numerous and sometimes opaque (I explored them in a January The New Republic article). But China has already begun to back away from its belligerent approach: After the Burmese government halted the construction of the Myitsone Dam, Beijing bluntly criticized Naypyidaw, and warned of repercussions. But then, according to both Burmese and Chinese sources, took pains to make sure that the relationship with Burma was back on track and solid once again. Similarly, despite tensions over the South China Sea, China has aggressively wooed the administration of Philippine President Benigno Aquino, and has worked hard to soothe Thai, Lao, Burmese, and Cambodian concerns about new Chinese patrols on the Mekong River. And after all, Beijing knows that, in the long run, all of Southeast Asia will become increasingly economically linked to China – China has a good, strong hand to play over time. Indonesia will regress. The most impressive democratic success story in Southeast Asia over the past decade (and one of the most impressive in the world), Indonesia is already beginning to backslide – one reason why polls earlier this year showed a high degree of nostalgia for Suharto’s time. In the run-up to the next presidential election, horse-trading will continue, while allegations of graft seeping out of the Nazaruddin trial will continue to poison public opinion of the government and politics in general. Worse, none of the potential candidates for the presidential election look likely to keep the country on a path of real reform. Burma will progress. 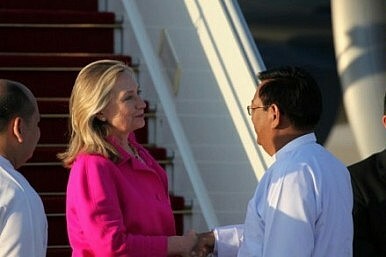 With one surprise piled on top of the next, the administration of Thein Sein now faces a crucial year in 2012. If Aung San Suu Kyi truly does compete in and win a by-election, there will be a real, vocal opposition in parliament for the first time, scrutinizing the government in a way that doesn’t happen right now. Is Thein Sein’s administration ready for this? I think so. Gloria Macapagal-Arroyo won’t go to jail for an extended period. Although the corruption charges against her continue to pile up, and she has none of the reservoir of support among the poor that former President Joseph Estrada enjoyed, former President Macapagal-Arroyo likely won’t go to jail – or, at least not for a significant period of time. Aquino’s campaign against Arroyo and the Supreme Court packed with her allies has much substance, but he’s increasingly risking looking like a man obsessed, and potentially on a vendetta. And while the former president may not be as unwell as she claims, the longer the campaign against her goes on, the more sympathy she may arouse. Anwar Ibrahim will go to jail. Bet on it. The United States will make little headway on trade leadership in the region. Despite the Trans-Pacific Partnership, which has value, all Asian leaders know that Washington isn’t going to pass more trade legislation in 2012, or probably not again in my lifetime. Joshua Kurlantzick is a fellow for Southeast Asia at the Council on Foreign Relations. He blogs at Asia Unbound, where this piece originally appeared. Ex-convict and former actor Joseph Estrada has reemerged as a major player in Philippine politics. Myanmar's Fighting Season in KachinGenocide or Not, Time to Act on Myanmar's Rohingya CrisisA Tough Year for Southeast Asia's Opposition PartiesNew Opportunities for the Women of BurmaBurma's Reforms: Window Dressing or Reality?